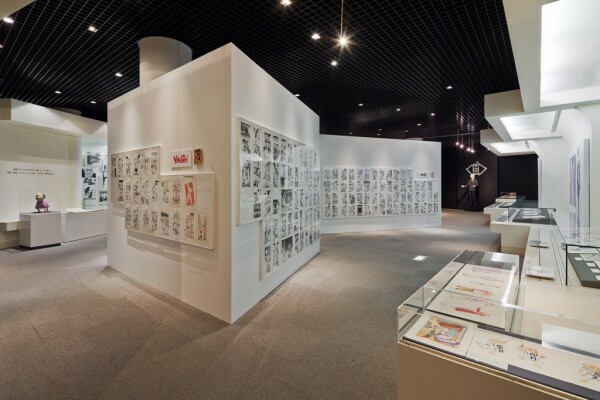 We designed the venue for the exhibition held at the Setagaya Literary Museum titled "Naoki Urasawa: A Life in Drawing". 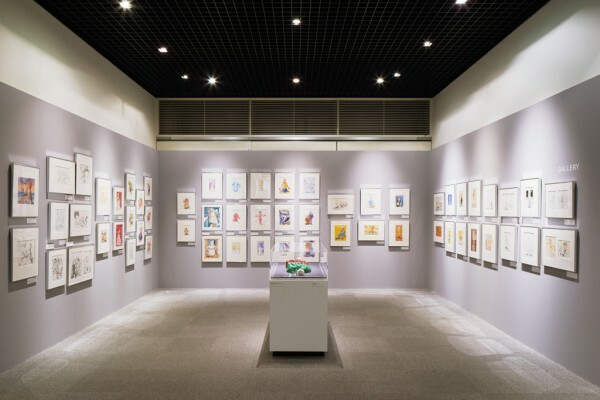 This is the first large-scale solo exhibition for the manga artist Naoki Urasawa, the unparalleled hit-maker behind works, such as Pineapple Army, Yawara!, Master Keaton, Happy!, Monster, 20th Century Boys, Pluto and Billy Bat, which are all considered masterpieces. 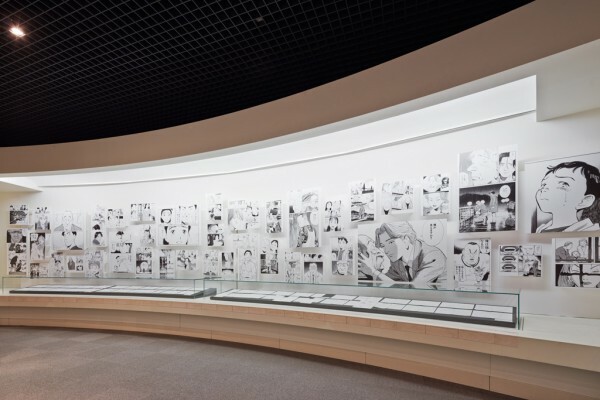 Using a large collection of original drawings and manuscripts, including drafts, conceptual story notes, storyboards, prized illustrations and sketches, and even manga notebooks from the artist's childhood, deliverables included an exhibition space where visitors can go beyond the page and get a sense of the amount of materials that went into the production of these works. 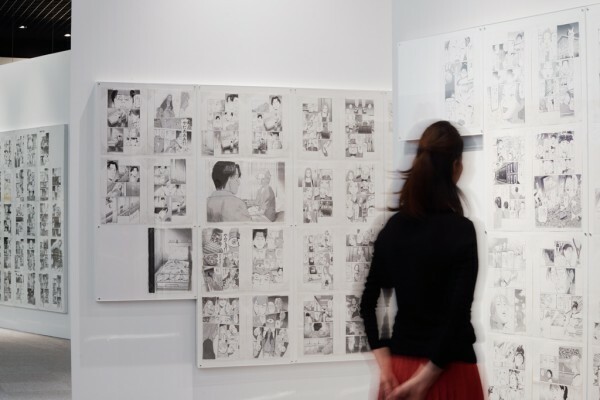 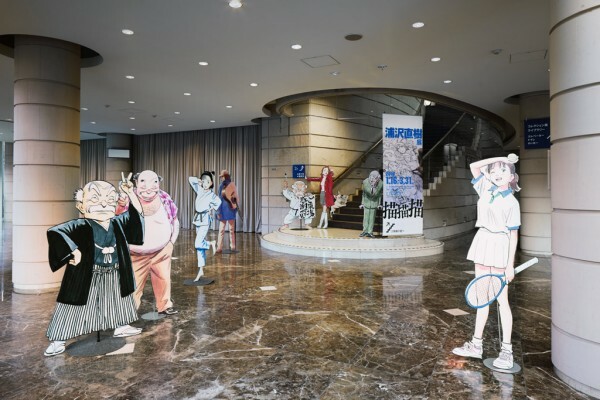 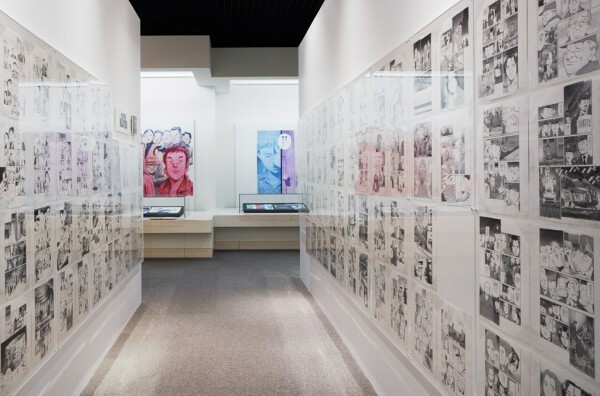 Visitors are greeted by cardboard cutouts of original characters which have sprung to life, before moving through an introduction section that conveys the sharpness of Urasawa's stroke through still and moving images, and reaching the original drawings corner at the center of the venue. 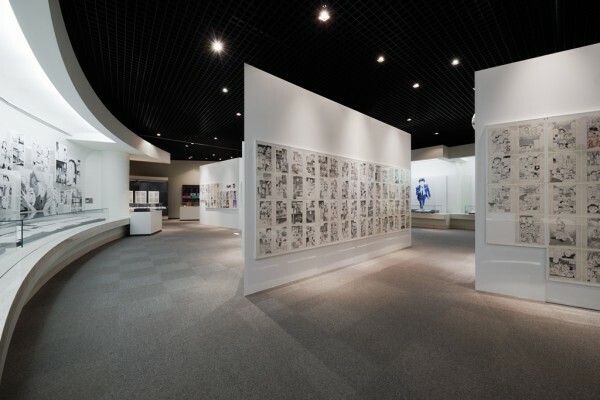 In this corner, we placed three exhibition walls shaped like distorted cubes to create an evolving scenery, while also guiding visitors. 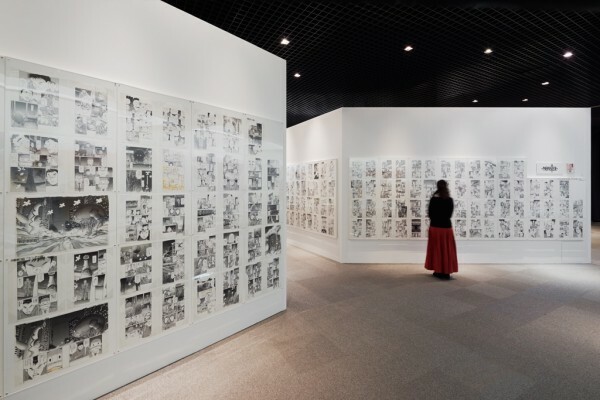 Each wall presents the spread-out contents of a single book to give a sense of the sheer amount of drawings that go into a volume. 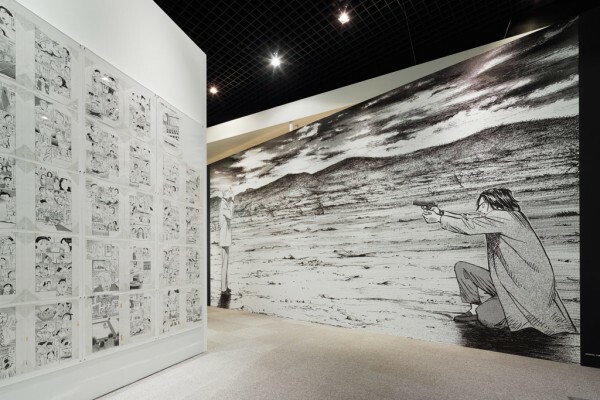 The curving wall presents a selection of scenes expressing emotion in a few frames made using cardboard cutouts of manga pages. 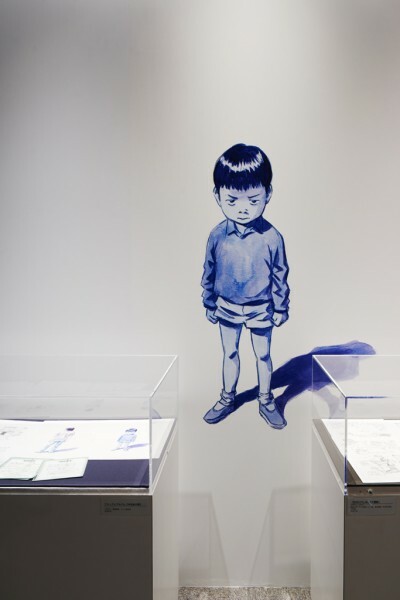 Located at the back of the venue, the exhibition concludes with a gallery of Urasawa's childhood drawings and other illustrations produced over the years. 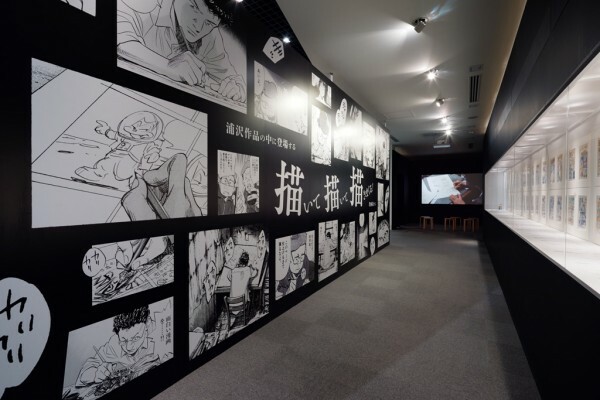 Moreover, enlarged reproductions of his original drawings can be found on walls here and there to create a sense of immersion into Urasawa's works, which is made possible by the artist's hyper-detailed drawing style. 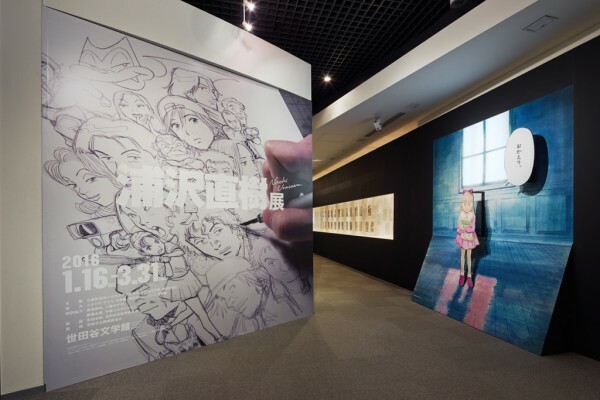 By giving a theme to each corner, we set up the venue as to impart a pace to the exhibition space. 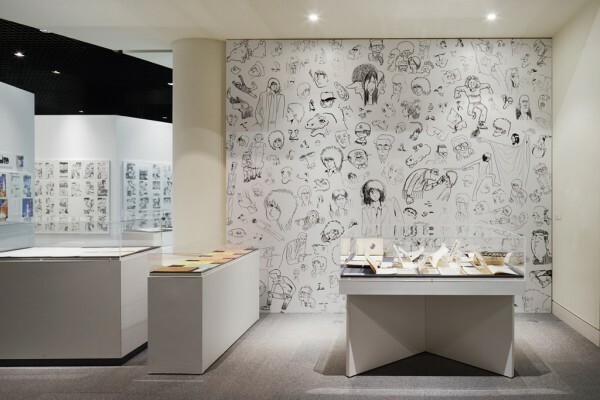 The space we created seeks to provide a rich exhibition experience through variations in presentation, while using a large collection of original drawings as materials.